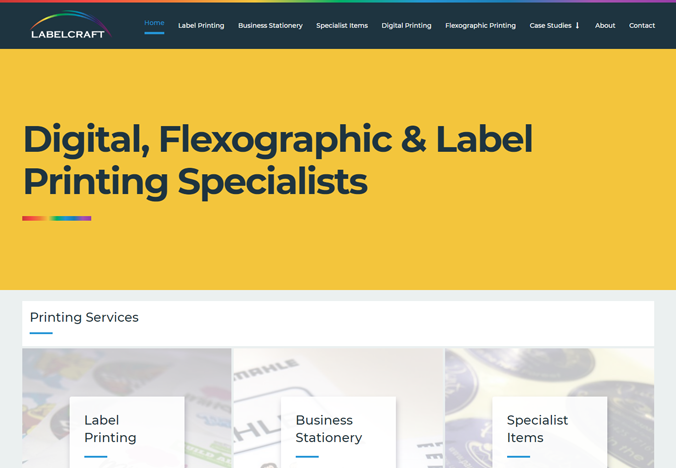 We are pleased to announce the launch of the brand new Labelcraft printing services website design and development. An existing business who specialise in digital, flexographic and label printing. You can visit the full website here www.labelcraft.co.uk. We specialise in Content Management System (CMS) websites which enables all our users to update their website quickly and efficiently. The main goal for this project was to merge to existing websites and increase conversion through better web design. The older websites were very dated and full of cluttered information that was often repetitive and hard to navigate. If you would like to find our more about the project you can view full case study. Looking for a brand new printing services website? Then contact us today for a quick chat to discuss your options.